Rabbi Aharon Yehuda Leib Shteinman was born in 1912. He married Tamar (Tema) Kornfeld, a descendant of Rabbi Moshe Chaim Rotenberg of Khentshin, a brother of the famed Chidushei Harim of Gur. Rebbetzin Tema Shteinman passed away in 2002. Rabbi Shteinman lives in Bnei Brak and is one of the most beloved and revered rabbinical figures in Orthodox Jewry today. Rabbi Shteinman is elderly and frail and nearing one hundred years old. Nevertheless, he makes himself available to the myriads of petitioners from around the world who seek his council and blessings. Rabbi Shteinman belongs to the Lithuanian branch of Orthodox Judaism. For decades he has been the Rosh Yeshiva of Ponevezh L'Tzeirim. He has authored brilliant scholarly works on the Talmud named Ayelet HaShachar which he originally published anonymously. Rabbi Shteinman, along with Rabbi Yosef Shalom Elyashiv is a leader of the Degel HaTorah political party, which is currently part of the umbrella United Torah Judaism list (an alliance of Degel HaTorah and the Agudath Israel party) in the Israelis parliament, the Knesset. In recent years Rabbi Shteinman has undertaken to travel around the globe where he has been meeting and addressing thousands of Jews, leaders and plain folk, to offer sage advice, counsel and blessings, as well as offering words of religious inspiration for the strengthening of Torah and Mitzvohs. In spite of his advanced age and extremely tight schedule, Rabbi Shteinman has tremendous concern for the poor and neglected families in Israel. He is an ardent supporter of and makes time to assist the Rabbi Meir Baal Haneis Salant charity fund in every way possible. All of Klal Yisroel fervently pray for the continued health and welfare of Rabbi Aharon Yehuda Leib Shteinman. 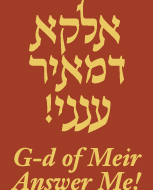 May G-d give him strength to carry on with his holy task of study, prayer, and communal work on behalf of the welfare of world Jewry.